Wow this is a new way to see things and another blow to Apple from a different prespective? His Holiness Pope Benedict is likely to pass a rule that will be against the Catholic faith of use of rubbers to fix the iPhone 4 issue! 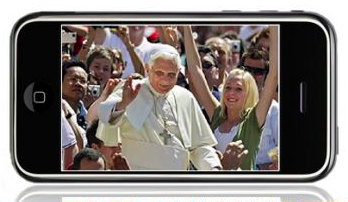 Looks like the Pope too didn’t like the idea of a phone with a broken design. Hopefully Apple will notice it that their issue is the design itself. Spokesman for the Pope, Rev Romeo Lovechild said that Pope Benedict was completely against placing a rubber “something” on anything. This will surely effect all those faithful customers of Apple. “We would not want Apple customers to face eternal damnation just for putting on a rubber,” he said. Rev Lovechild also said that any one who wanted to use a rubber should approach their local priest for counselling. The Roman Catholic church’s ban on rubbers has a long history and was from Pope Paul VI who reaffirmed the Church’s position in his 1968 encyclical Humanae Vitae (Human Life). From his writings which say that the use of a rubber protection “contradicts the will of the Author of life [God]. Hence to use this divine gift while depriving it, even if only partially, of its meaning and purpose, is equally repugnant to the nature of man and of woman, and is consequently in opposition to the plan of God and His holy will”. Well thats it then, no more rubber for you Apple. You either stay on the good side or wear a rubber and be damned! We regardless of what will happen, Apple has got much attention because they wanted it. The “lost iPhone4 prototype” stinct created much curiousity about the phone. And when it was out the design flaw was something Apple is not used to.